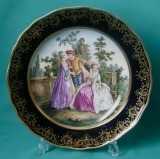 A Large 19th Century Continental Biscuit Porcelain Figure Group "Judgement of Paris" (possibly Sevres), depicting Paris wearing a Phrygian cap, lion's skin, breeches and sandals, kneeling and presenting Venus with the Golden Apple, she scantily draped and with a garland of laurel in her hair seated on clouds, Cupid standing to her right holding a dove and stroking a spaniel, Minerva and Juno behind her, Minerva in a helmet surmounted by an owl and wearing a breastplate over a flowing dress, her shield moulded with the head of Medusa, Juno with pearls in her hair, in a long flowing dress, lying in her chariot with two peacocks and her drapery flowing in the wind, among clouds on a high oval waisted base. 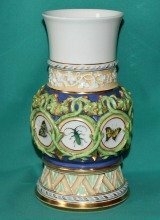 Dimensions: 38 cm high. Weight: 8.2 kg. net. Minor damage. Marks: Incised "Le Riche"*. 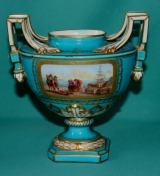 A fine 19th Century Sevres Porcelain Vase, hard-paste body, boat-shaped, fitted with twin handles, the central panels painted with harbor scene, signed "G. L Morin 1768" and a bird, on "bleu du ciel" ground and fine gilding. Dimensions: 16.5 cm high. Painted marks in blue on the base. Excellent condition. 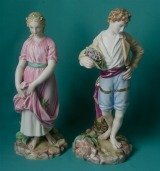 A Pair of 19th Century Samson Porcelain Figures, modelled as a Turk and his Companion, each standing on a round base, applied with leaves. 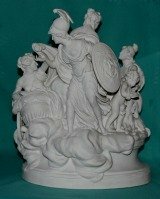 Dimensions: 9.5" (24cm) high. 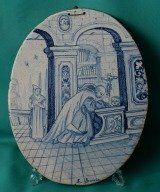 Marks: mock Meissen marks in underglaze blue, impressed numbers. 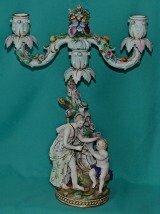 Condition: Each figure with two missing fingers on one hand and small chips on the leaves on the base. 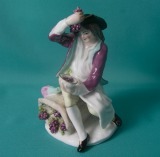 A 19th Century Samson Porcelain Figure Emblematic of "Autumn" (After Meissen model by J.J. Kandler)*, hard paste body modelled as a young man in a turned hat, long coat and trousers, upholding grapes with a bowl beneath, seated on a basket of vines with a flagon on top, on a pad base. Dimensions: 13 cm high. Unmarked. Condition: a small chip (inside the basket). 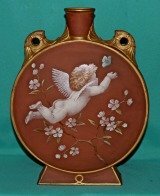 * This figure is very familiar in Bow soft paste porcelain. 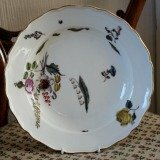 The Bow versions appear in the early 1750s and were reissued, on high scroll bases, in the 1760s. 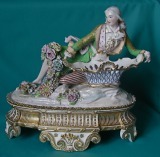 A large Jacob Petit Porcelain Figural Inkstand c.1840, finely painted with colours and gilt, the cover modelled as seated young gentleman, wearing 18th Century costume and holding a basket, his legs covered with encrusted flowers; the encrier base richly painted in gilt, with two quill holders, an inkwell and a sander. 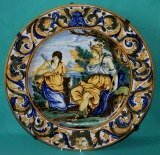 Dimensions: 33 cm x 35 cm high. Weight: 6.1 kg. Minor damages. 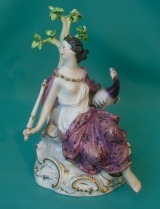 Both inkstand and cover with painted marks J.P to reverse. 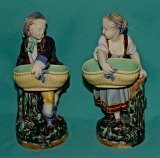 A Pair of Jacob Petit Porcelain Figural Scent Bottles c.1840, modeled as seating musicians, finely painted with coloured enamels and gilt. Dimensions: 19th cm. high. Incised marks. Condition: small chips on the stoppers. 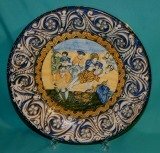 An unusual 18th Century Meissen Porcelain Plate, gilt metal mounted, painted in underglaze blue with the popular "Strawflower" Pattern and "Clobbed" decoration in coloured enamels and gilt. Marks: Straight blue crossed swords, 13 impressed. Condition: slight ware. 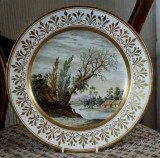 A Sevres Porcelain Plate c.1839, the centre decorated with rosette pattern in gilt, the borders with "LP" monogram among ribbon-tied branches, insects and birds in flight. 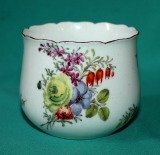 Dimensions: 24cm diam. Printed marks and Scateau de Fontainebleau stamp, dated 1839. Condition: Small chip restored on the rim. 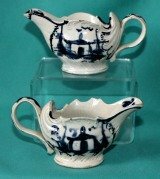 Two Vienna Porcelain Cream Jugs, decorated in neo-classical style with "Fond bois"* pattern c.1795-1800. Dimensions: 11cm and 12cm. high. 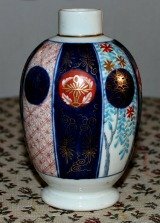 Marks: Shield in underglaze blue, impressed numbers. Condition: Some damage to the handle of the bigger jug. * Fond bois (French): This type of decoration resembling grained wood was first introduced at Niderviller c.1770. 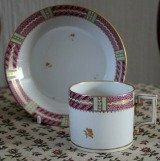 The pattern is also known as decor bois, bois simule or trompe l'oeil sur fond bois.